If you consider that for most amateur athletes a really repectable time to run 26.2 miles is under four hours, then they will need to take on food as well as hydration. When we eat even the most simple foods blood is re-directed to the stomach to process using vital time and energy. 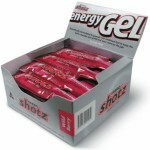 CarboSHOTZ Energy Gel is a complex carbohydrate liquid/gel that is designed to fuel active muscles during activity. The science behind these gels is to minimise the amount of time required to process a food into glycogen. Over the course of a marathon the average runner can store approximately 8000 kj or 2000 kcal of glycogen in the liver and muscles, this is enough for 18-20 miles. When glycogen runs low our bodies are forced to burn fat to compensate, but fat is not as easily converted. At this point the runner will experience a dramatic increase in fatigue, known as ‘hitting the wall’. The key here is to minimise the amount of blood being taken away from the active muscles when converting food to fuel. What differentiates the carboSHOTZ Energy Gel is that it is low in sugar, is gluten free and does not contain any fructose which would need to be converted to glucose by the body – so the blood, with the help of electrolytes, is delivering oxygen, nutrients and carbohydrate to the active muscles. For hydration the electrolyteSHOTZ Tablet is an effervescent tablet that dissolves in water, it is sugar free and has no artificial colours. Wilson backs Paddy Slam, or is it?